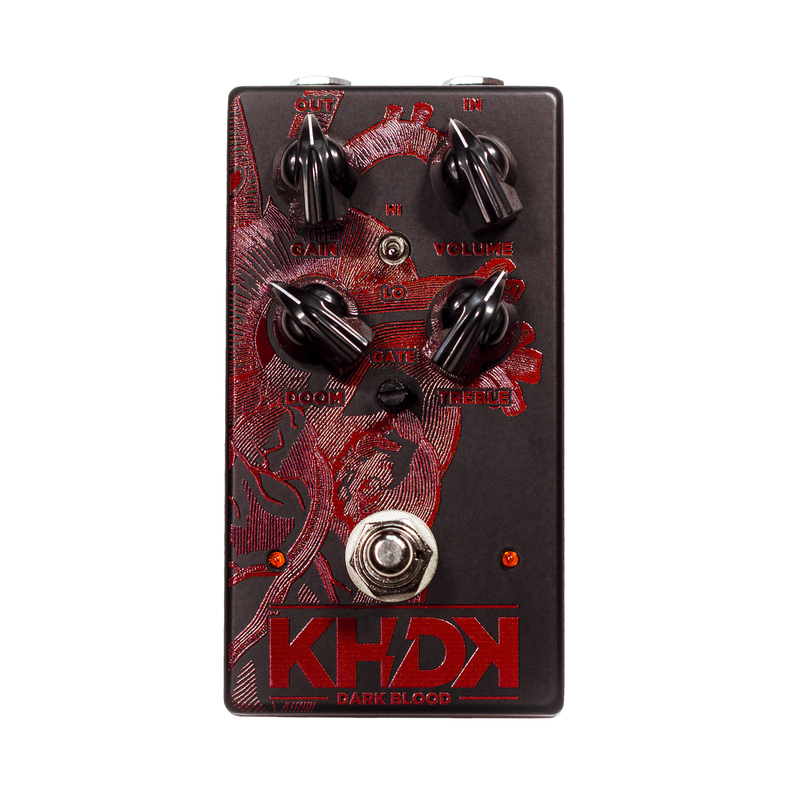 The Dark Blood is the new pedal from KHDK. 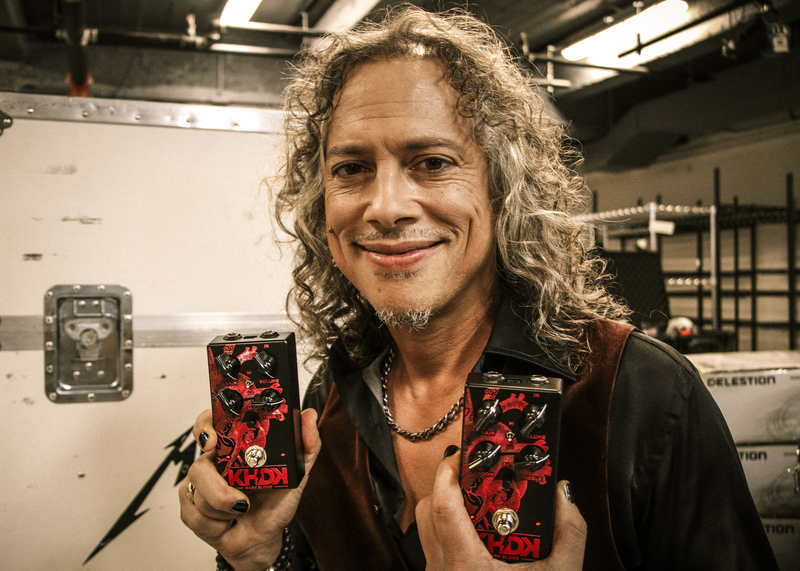 The partnership between a certain Kirk Hammett and his business partner David Karon. Combining solid state and mosfet technology this pedal delivers an amp like sound with plenty of gain and a powerful mid heavy tone. 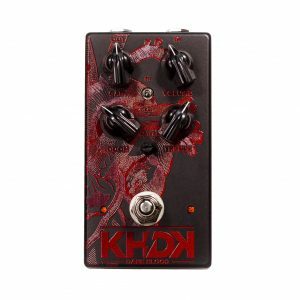 I tried this pedal through a speaker simulator straight to the desk and through the clean channel of my old 6L6 loaded 120 watt valve amps clean channel and it performed exceptionally well in both circumstances. You can trust me when I tell you there is plenty of gain on tap. Keep the gain low and the Doom counter clockwise and its tight. Perfect for those heavy riffs. Increase the gain (use the gate to keep the background noise in check) and the clarity remains which is not something that can be said of all pedals of this type. Turning the Doom clockwise increases the bass and gives you a spongy amp like feel under your fingers, perfect for those blazing fast lead runs and long sustaining notes. The treble control is a passive low pass filter and is wide ranging enough to let you tailor the top end from bright and cutting to a more mellow smooth tone. The HI/LO toggle switch offers two types of gain. LO is geared more towards rhythm while the HI mode adds compression giving sustain to your lead tone. The aforementioned gate is an excellent addition and careful use keeps the background noise to a minimum without impacting on your tone. Yes this pedal can do metal standing on its head but its crunch and lead tones really are wide ranging enough to cover many tones outside of this genre. There are plenty of tonal options from the wide range of controls on this pedal. If you are looking for a distortion pedal this is definitely worth adding to your list of must tries. LP 380- Slimline Digital Piano – Beauuuuuuuuuudiful…..